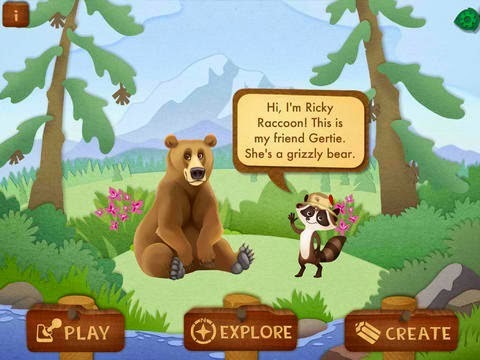 This interactive app is very similar to the popular Ranger Rick Jr. Appventures: Lions. It comes with three categories: Play, Explore, and Create. 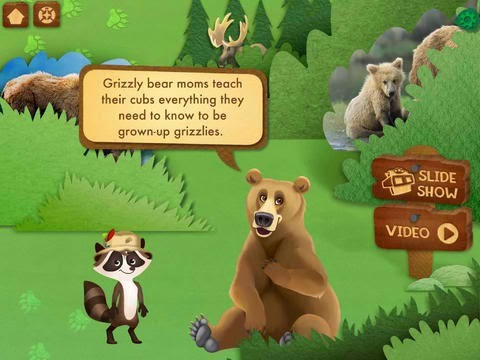 The Explore category is perhaps the best place to start as it takes your child around the forest learning about grizzly bears. 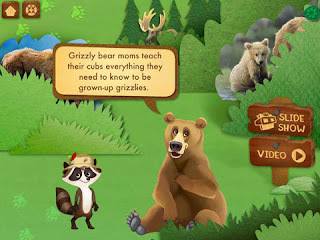 Kids just tap on images to learn fun facts, play games, see slide shows, watch videos, and more. Afterward, if your child would like to play the games over again, they simply click on the home page and then the Play category which features 4 different games: Jigsaw Puzzle, Where's the Bear?, Go Fish!, and Match Sounds. The puzzle game allows your child to choose from a variety of images and level of difficulty (9, 16, or 25 pieces). In Where's the Bear?, children have to move the iPad all around to take pictures of the bears. Go Fish! 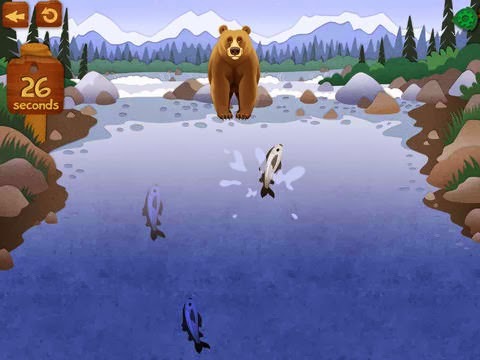 requires your child to manipulate the iPad in order for the grizzly to catch and gobble up salmon as they swim upriver. And finally, Match Sounds requires your child to accurately match the animal to the sound they hear and learn some fun facts along the way. The Create section has a Sticker Board, and Animal Piano, and an Animal Builder that lets you take parts of different animals and combine them to create a completely new one! What my kids like: While my kids enjoyed the entire app, they really liked the Go Fish! game best, followed by the Match Sounds game. I think they like the fact that they have to move the iPad all about in order to manipulate the characters on the screen. They enjoy learning about nature and animals then telling me all about them. What I like: The science behind the app is always a plus in my book. And I love that the games are very clever, like Go Fish! 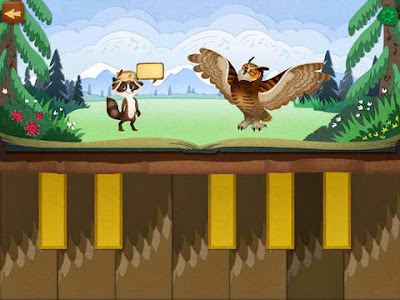 which takes a real adaptation of the animal and presents it to kids in a fun way. Notes: This app is available in English only. Disclosure: I received a copy of this app for review purposes. All thoughts and opinions are my own.